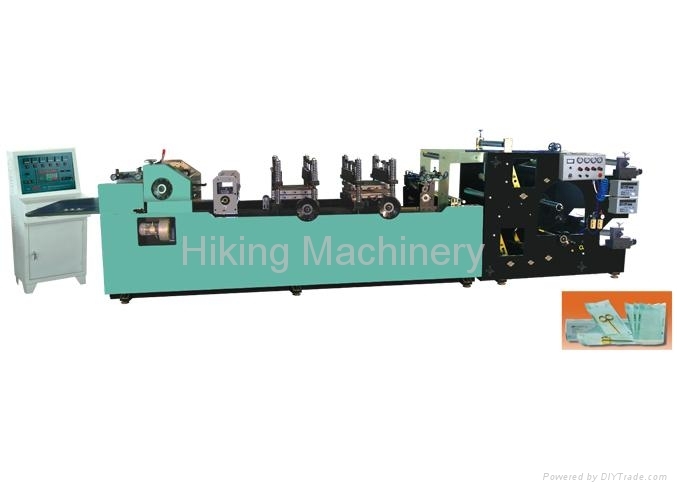 This machine specially used in paper,two layers of heat-sealing,Heat sealing is through shaped die set(some die sets can be made)and Through vertical cutting,edge cutting,and cross cutting.The speed of the host machine is adjusted with frequency converting,double working position level feeding material and its tensile stress is automatically controlled.It is suitable for sterilizing package in medical appliances.It can make dotted line,hole punching and stamping glue slice. It is also proviaed with up and down heat-sealing,cooling equipment.Adopted computer controlling system and tonch buttons,it is easy in set its length. It has the functions of figures displaying,automatic alarming when reaching the set value.Adopted a high accuracy step motor and a fine slitting driver,it is easy to make the material more steady, accuracy and speedy.